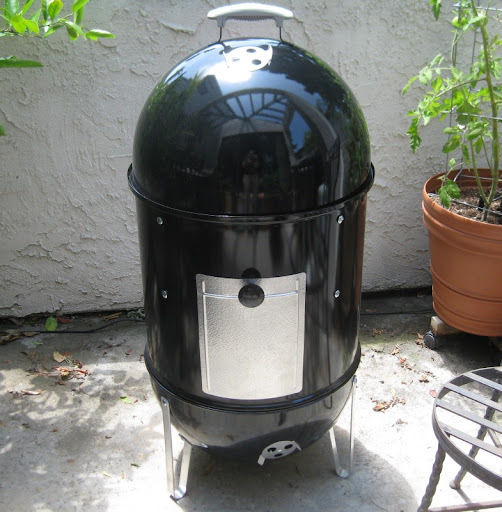 Behold the latest object of our affection - the Weber Smokey Mountain Cooker. Inspired by the amazing barbecue we had on our road trip, we decided that we had to have a smoker. Initially we considered purchasing an electric version since they're reliable and ultra simple to operate. But that seemed boring. What fun is cooking with smoke if there's no fire? Kirk - definitely more smoking posts to come! 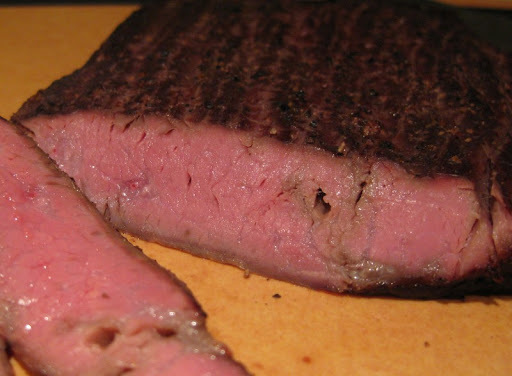 We did a nice, slow smoke for the flank steak: Seasoned with kosher salt and cracked black pepper; Smoked with Pecan wood for 2 1/2 hours at temps ranging from 195-215*F; Pulled when internal temp was 134*F. Wow, that was good stuff. Definitely give it a try! Hi Sherry and Mike! I finally caught up with all your smoking posts. I am going to work down your list of meat, minus the homemade sausages. :-) I have a duck in the freezer that I'll hope to smoke for upcoming Labor Day weekend. Hopefully mine will turn out as good as yours.